Note: This post first appeared on Education.com June 4, 2018. That piece is titled Scaffolding Instruction for English Learners: A Q&A with Diane Staehr Fenner. 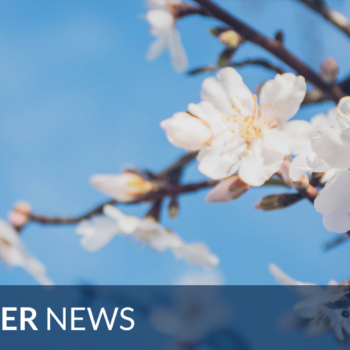 With English learners (ELs) numbering more than 4.8 million and comprising 10 percent of the general school-aged population, all teachers should consider themselves teachers of ELs. To that end, all teachers must have strategies and tools to support ELs in accessing challenging content while helping them acquire academic language. With the right tools, teachers can easily incorporate the instructional strategy of scaffolding into their teaching. How can teachers acquire these tools? For this, Education.com turns to the EL expertise of Dr. Diane Staehr Fenner, the president of SupportEd, a woman-owned small business based in Washington, DC that provides EL professional development, curriculum and assessment expertise, and programmatic assistance to school districts and states. Diane Staehr Fenner: First, let’s make sure we’re all on the same page when it comes to our understanding of scaffolds. According to PaulineGibbons (2015), a scaffold is a temporary support a teacher provides to a student that enables the student to perform a task he or she would not be able to perform alone. This support comes in such forms as classroom materials and/or resources provided to the student, the instructional practices the teacher uses, or even how students are grouped during instruction.1 Scaffolds will vary and change over time as ELs’ knowledge of content and academic language increases.2 In fact, our goal when scaffolding for ELs is ultimately for them to be able to perform the task independently and without use of scaffolds. What are different types of scaffolds for ELs? Diane Staehr Fenner: Scaffolds can be grouped into three categories: Materials and resources, instruction, and student grouping. Our “Categories of Scaffolds and Examples” table shares examples of each category of scaffold, though this list is not exhaustive. In my collaboration with teachers of ELs, I find that many only think scaffolds fit into the “materials and resources” category. Often, they’re surprised at the types of scaffolds that we consider to be within the “instruction” and “student grouping” categories. Sometimes, they’ve been scaffolding for ELs all along but just didn’t realize it! How can I select scaffolds by ELs’ English Language Proficiency Level? 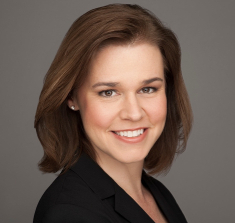 Diane Staehr Fenner: Now that you’re more familiar with what scaffolds are, as well as the three different categories of scaffolds, the next step is to select and try out some scaffolds for ELs. It can feel a bit daunting to try out a scaffold or two if you haven’t done so before. So, I’ll give you some guidance to help out. In order to select appropriate scaffolds, you’ll need to know your ELs’ backgrounds, as well as their academic strengths and needs. You’ll also need to have a sense of the linguistic demands of your instructional tasks to determine which scaffold(s) will best support your ELs in being able to successfully engage with and complete the academic task. Selecting scaffolds can cause us to look at our instructional tasks in a new, exciting way. Instead of simplifying the tasks we give ELs, it is instead the nature of the scaffold that is critical for ELs’ success with a particular lesson.6 As you consider how to scaffold a specific activity, think about the three categories of scaffolds that you may wish to include; you don’t have to include all three of them. 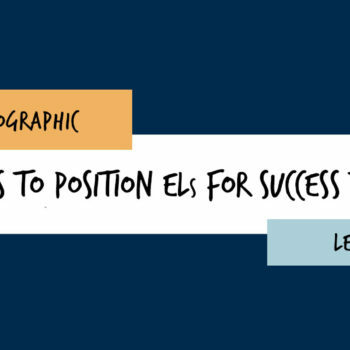 Your ELs’ strengths and needs will vary depending on the academic task that they’re working on. Also, please keep in mind that there are no hard and fast rules for selecting appropriate scaffolds for ELs of varying proficiency levels. 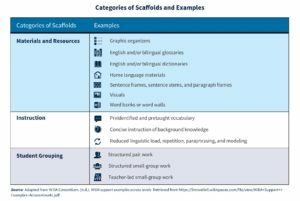 Some scaffolds might be developmentally appropriate for all students (e.g., graphic organizers or pair work) and may be used as supports for the whole class, including English proficient students. It is also important to note that an EL’s need for a particular scaffold will vary depending on his or her familiarity of the content and the complexity of the task. The table below provides some general guidelines for you for selecting scaffolds for ELs at different English language proficiency levels or ELP (beginning, intermediate, and advanced). This graphic is adapted from my scaffolding collaboration with Dr. Diane August. Even though this table provides a starting point, I always suggest using your professional judgement when selecting scaffolds. How can I incorporate scaffolding for ELs into my lesson planning? Diane Staehr Fenner: Once you have selected a scaffold or two to try out with your ELs, it’s time to think a bit more deeply about how you’ll incorporate those scaffolds into your instruction. 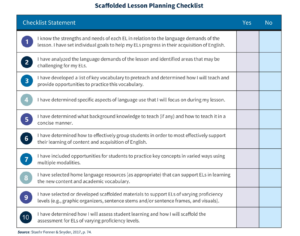 Our “Scaffolded Lesson Planning Checklist” will provide you with some considerations in doing so. In scaffolding instruction, I recommend you constantly reflect on the efficacy of particular scaffolds you use and adjust your instruction appropriately. How can I collaborate to scaffold ELs’ instruction and assessment? Diane Staehr Fenner: One final consideration in successfully scaffolding instruction and assessment for ELs is to collaborate. As you begin scaffolding your instruction, think of other teachers who could support you in this endeavor. If you’re a grade level content teacher, you could turn to an ESOL teacher in your school for resources and advice on how to scaffold a particular lesson. If you’re an ESOL teacher, you could offer to work with content teachers to suggest scaffolds for particular lessons and assessments. You also may wish to offer to model the use of scaffolds in a particular lesson. Collaboration is key to successfully implementing scaffolding for ELs. 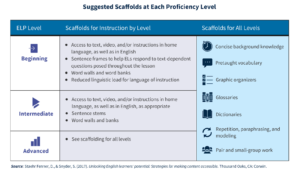 This is a starting point to help teachers incorporate scaffolds into their instruction for ELs, framed around one chapter in Unlocking English Learners’ Potential: Strategies for Making Content Accessible by Dr. Diane Staehr Fenner and Dr. Sydney Snyder. The book offers a toolbox of strategies for teaching ELs and ensuring they can succeed in today’s more rigorous classrooms. For more in-depth training on scaffolding for ELs, please see SupportEd’s face to face and online professional development. Gibbons, P. (2015). Scaffolding Language, Scaffolding Learning: Teaching English Language Learners in the Mainstream Classroom. (2nd ed.) Portsmouth, NH: Heinemann. Daniel, S., Martin-Beltrán, M., Peercy, M., Silverman, R. (2015). “Beyond “yes or no?” Shifting from over-scaffolding to contingent scaffolding in literacy education with emergent bilingual students.” TESOL Journal, 7(2), 393–420. Gottlieb, M. (2016). Assessing English Language Learners: Bridges to Educational Equity: Connecting Academic Language Proficiency to Student Achievement. Thousand Oaks, CA: Corwin. Gottlieb, M. Katz, A., & Ernst-Slavit, G. (2009). Paper to Practice: Implementing TESOL’s PreK-12 English Language Proficiency Standards. Alexandria, VA: TESOL International Association.